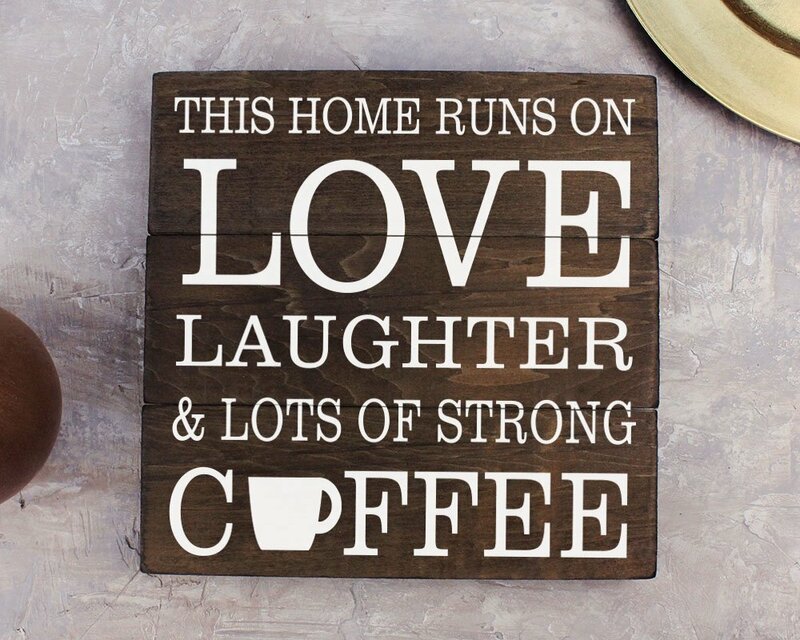 If you LOVE coffee, the way I LOVE coffee, then the idea of adding some fun and wonderful coffee decor to your home has a certain caffeinated appeal. 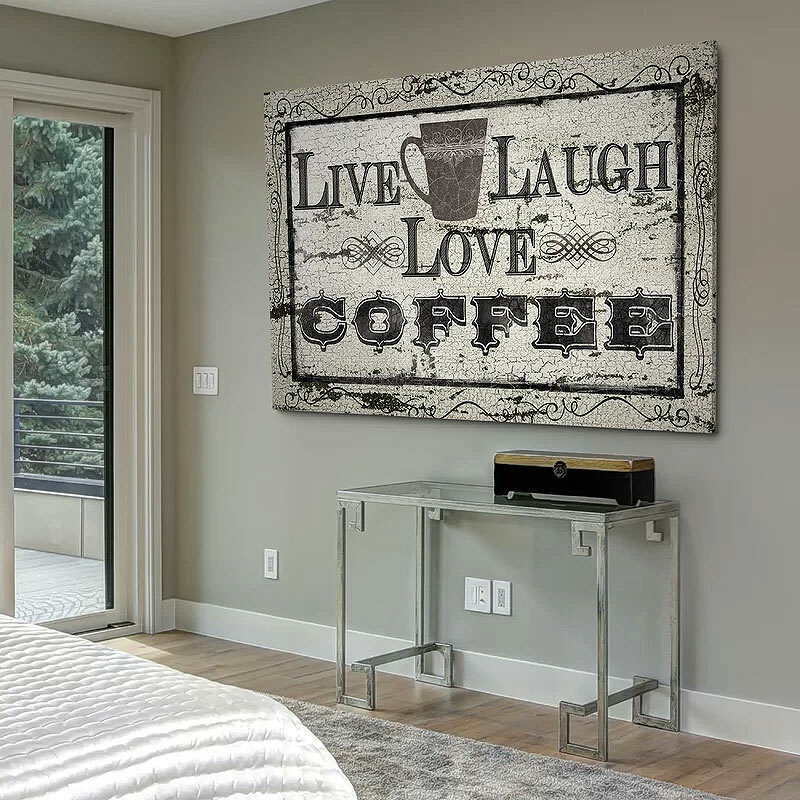 To aid you in that quest, I have gathered some of my favorite pieces of coffee art, coffee decor, and other coffee-related accents that can add a touch of fun and interest to your home and help you celebrate your love of fine coffee. I love the multi-dimensional aspect of this metal coffee art sign. The swirled coffee cup is layered on top of a warm, coffee-colored background that includes some coffee text art. Perfect for the kitchen or breakfast nook! This sign pretty much sums up my relationship with coffee. This unframed wood plaque would suit both a Farmhouse or Industrial decor. Or, really, anyone who understands coffee’s impact on our speed, and enthusiasm… if not always on our sanity. 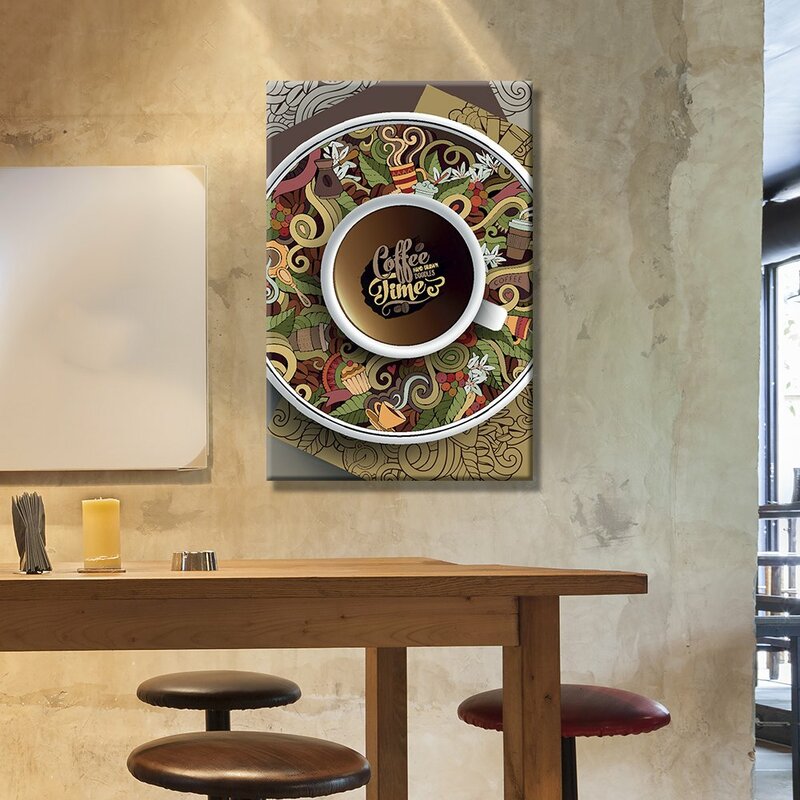 This piece is more of an abstract take on coffee art, with a series of coffee circles from various size mugs represented on a warm, rich canvas piece. 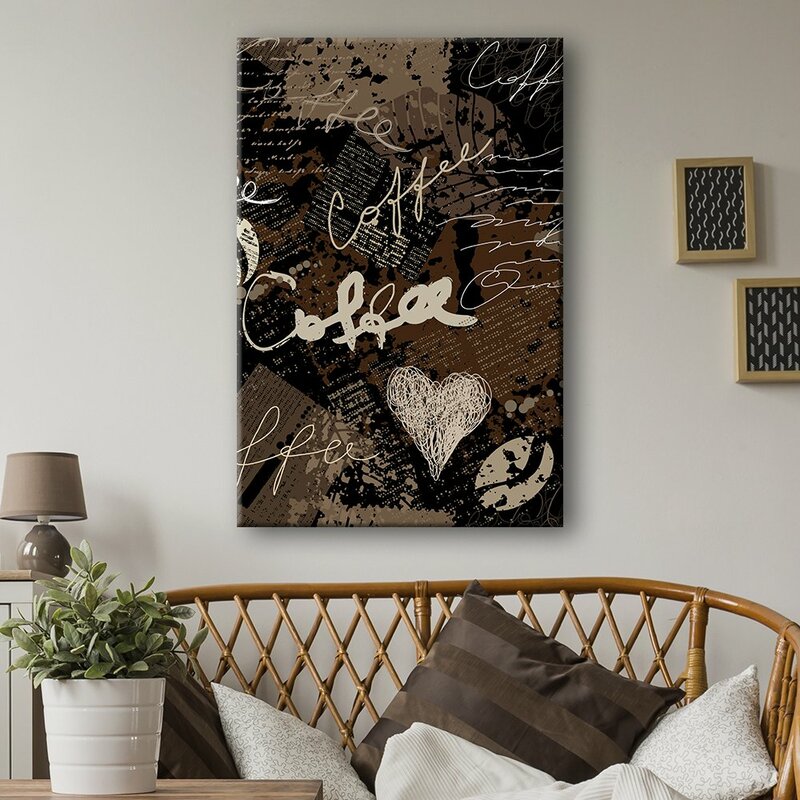 I love the distressed look of this piece, combined with the lighter weight of gallery-wrapped canvas that makes it easy to hang, even if you haven’t had enough coffee yet. Plus, it’s available in 4 different sizes, ranging from 12″ x 18″ up to 32″ x 48″, so you can add it as a nice coffee decor accent or as a featured piece. Coffee. Need we say more? With bold typography and lightly weathered details, this artwork pays tribute to our favorite beverage on any wall. Printed on wood, this accent brings a rustic touch to your decor. Some of these coffee decor and coffee art pieces would also make great gifts for the coffee lover in your life (if that isn’t you). I love this whimsical clock. Colorful and fun! Truer words were never before written on a kitchen floor mat! Jennifer Lommers is known for creating bright and vivid slices of live in her art. Here, she tackles morning coffee in a delightful and romantic way. This piece celebrates coffee in a very elegant manor. There is also a coordinating coffee art piece that is opposite in both orientation and contrast. 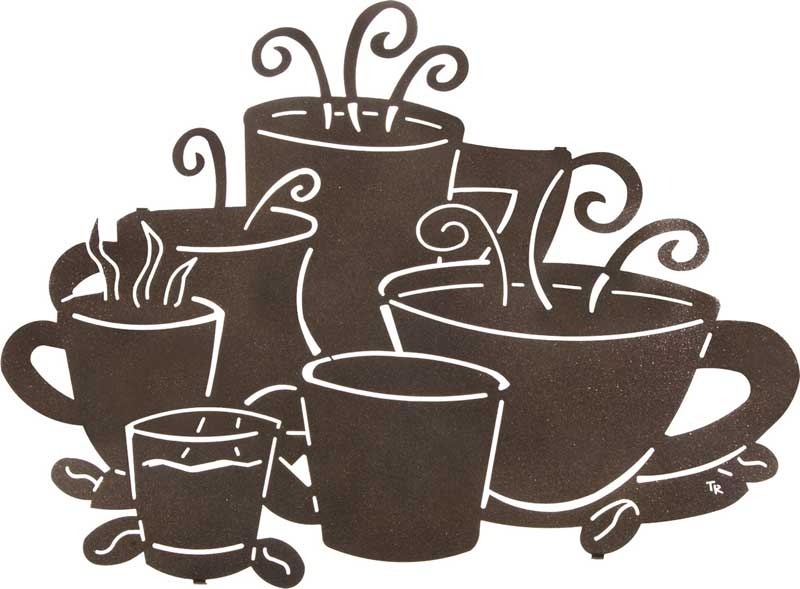 SOOO many different kinds of coffee are celebrated in this wonderful metal coffee art piece. 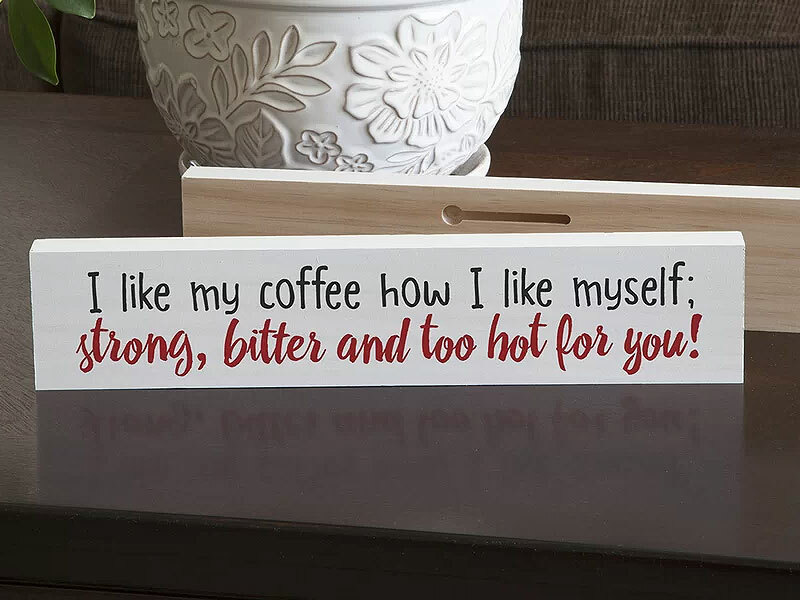 This humorous plaque can be hung or rested practically anywhere to create a fun piece of coffee decor for your home. 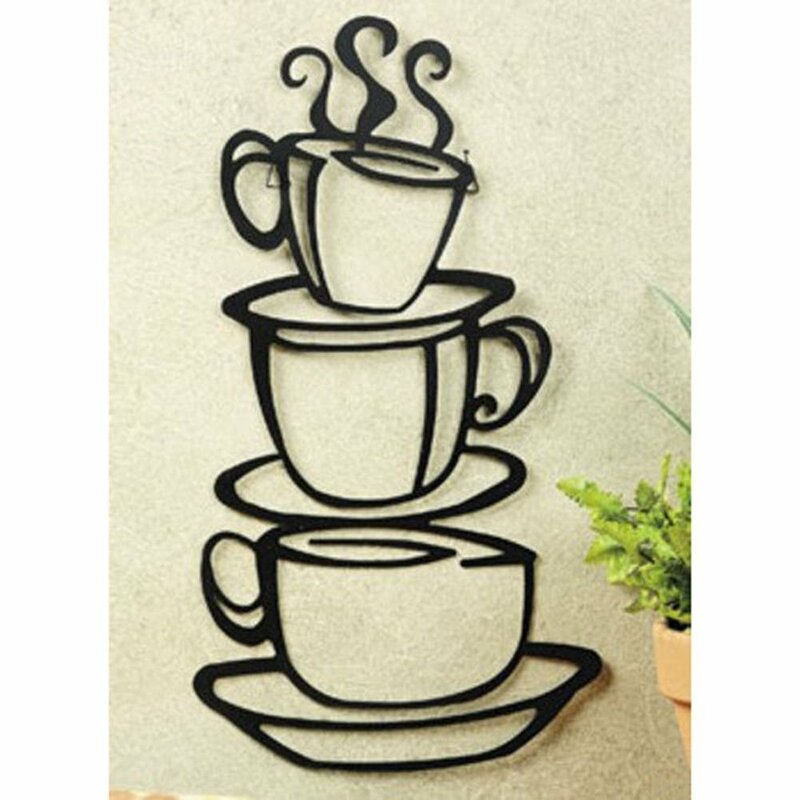 A simple outline of stacked coffee cups makes this coffee wall decor piece charming and delightful. Although I am not, personally, a fan of instant coffee. I am a fan of this coffee-themed tapestry wall hanging. 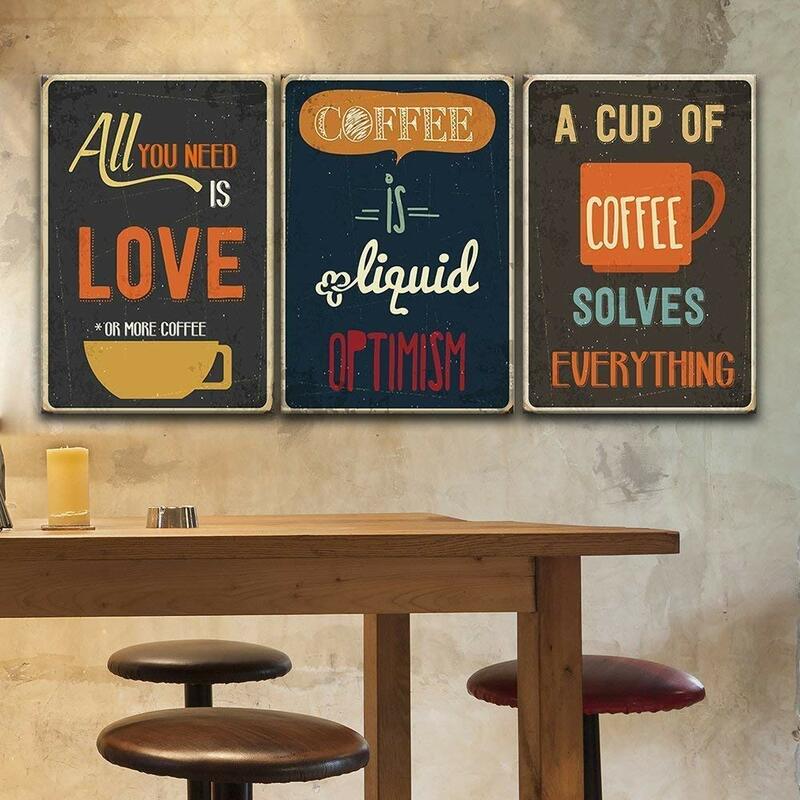 Coffee decor has a solid place in the metal wall art world. There’s something about the visuals of a coffee cup that can be created in so many unique ways using metal. Another delightful example of coffee-themed metal wall art. I love the vibrant fun of this graffiti style coffee art. 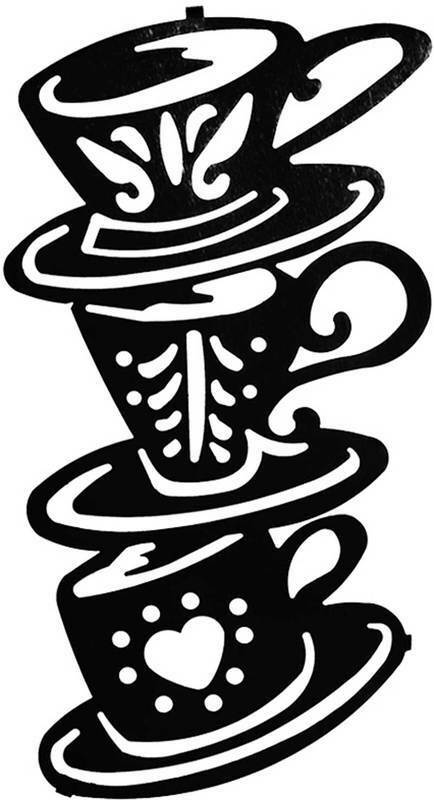 But if your prefer a softer side of coffee art, this delightful piece might be your cup of Joe. Evoking the elegant charm of street-side cafes in Paris, this alluring art print is a must-have for your sipping space. Warm, Rich, Bold, or Sweet? How Do You Take Your Coffee Decor? 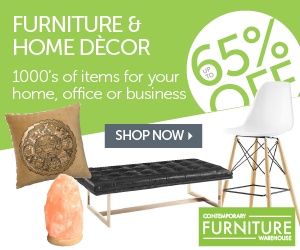 Although most of the coffee decor pieces we’ve selected would be best suited for a kitchen, there are a few select pieces that could be used in either a dining room or living room. This is one of those pieces. This, however, is not. 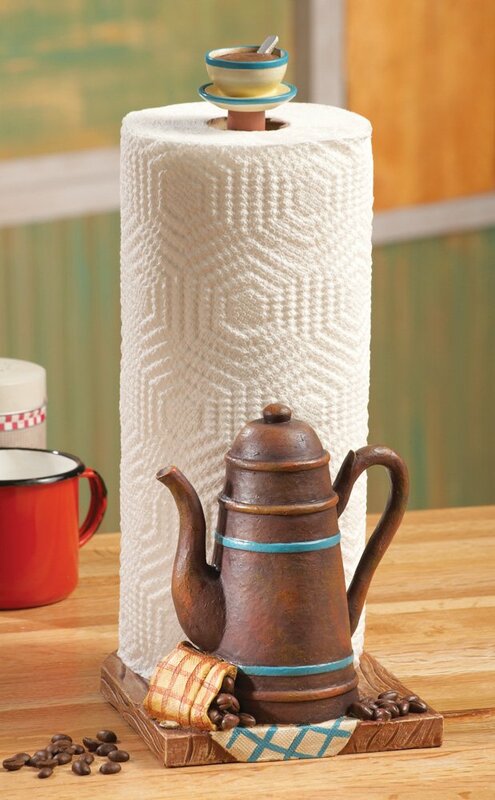 The coffee pot paper towel holder has only one proper home… the kitchen. 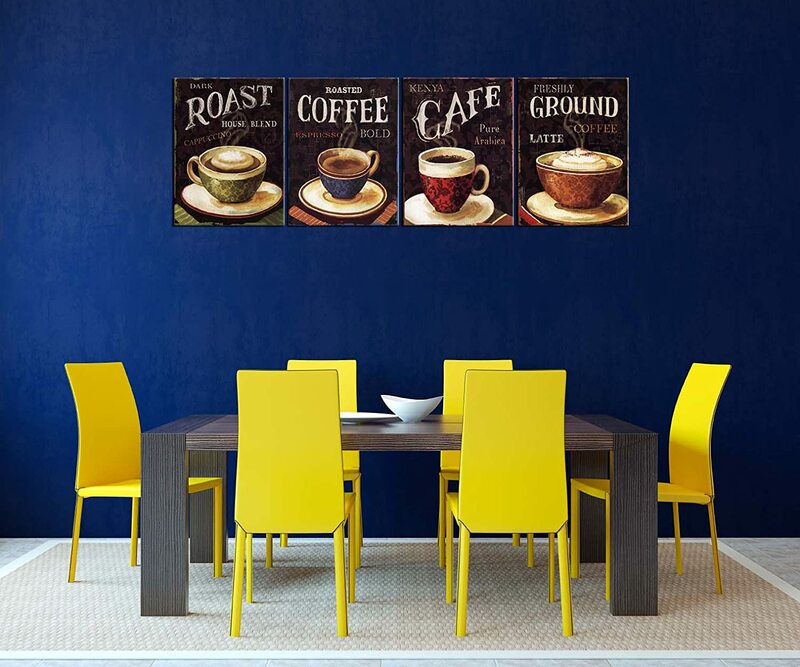 One of the great things about this 3 piece coffee art set is that you can hang the pieces however you want to create the coffee-themed focal point however you desire. Hang them together, as shown, to create a delightful triptych. Or you can space them out to add a touch of coffee decor to different spots in your home. For those who appreciate their morning cup of coffee, and their evening glass of wine… this set is the perfect combination of both! 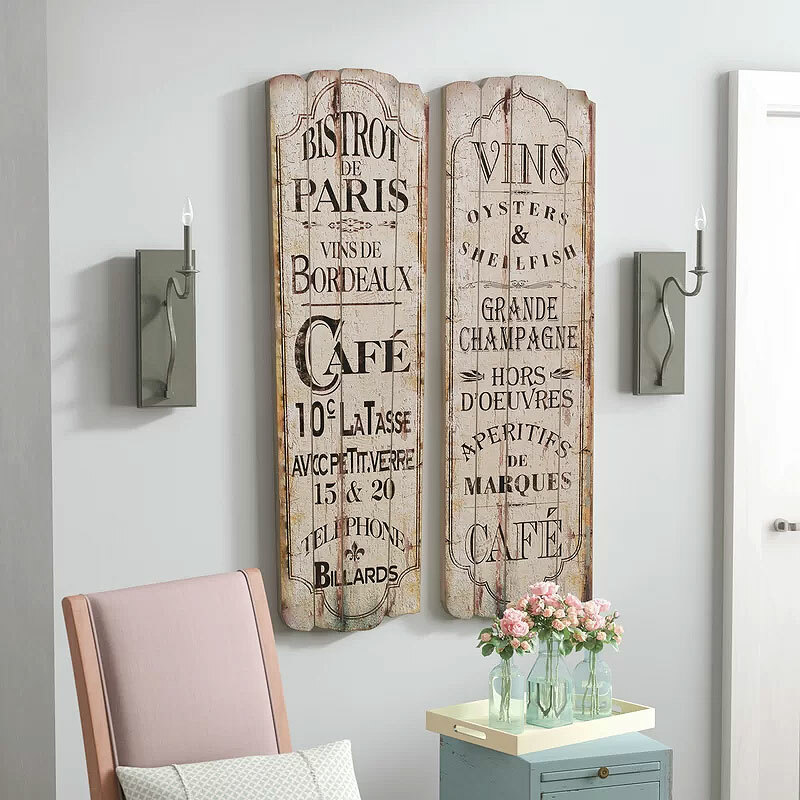 Inspired by a trip to your favorite French countryside bistro, this two-piece textual art set lends Provencal charm to any wall in your well-appointed home. 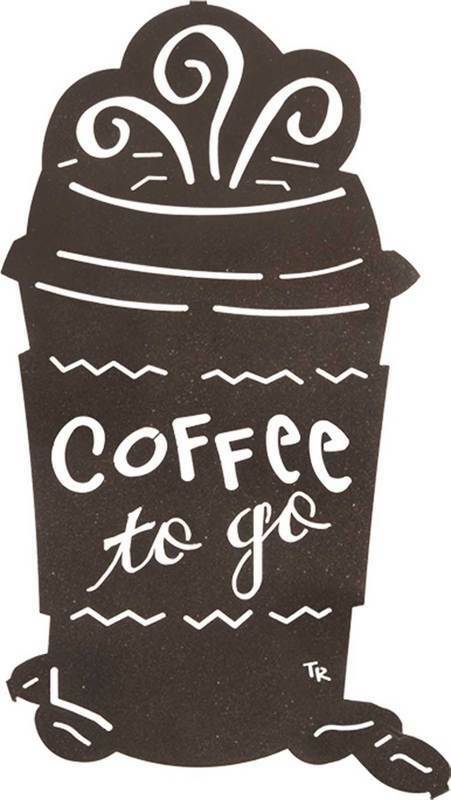 Isn’t It Time You Added Some Coffee Decor to Your Life? Both the shape and the words on this coffee-themed clock ring true to my coffee-loving life. 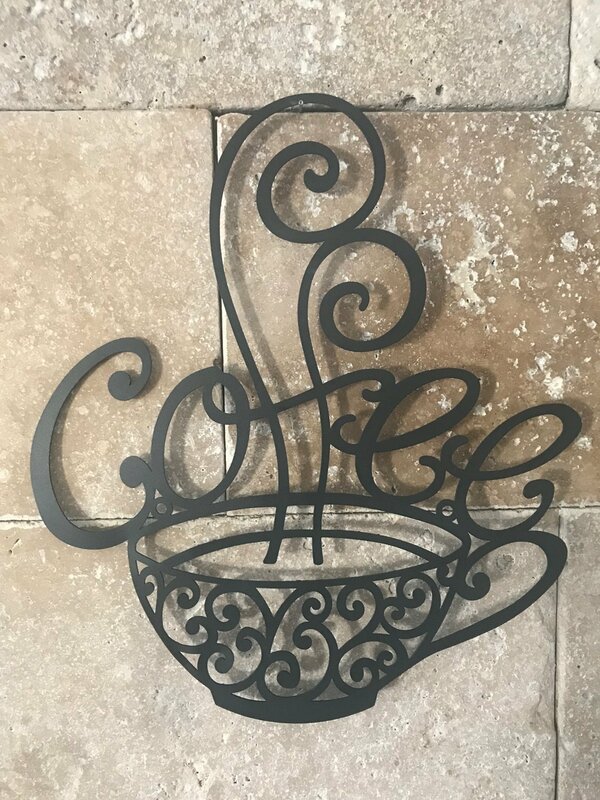 This functional piece of coffee decor would be perfect in the kitchen! 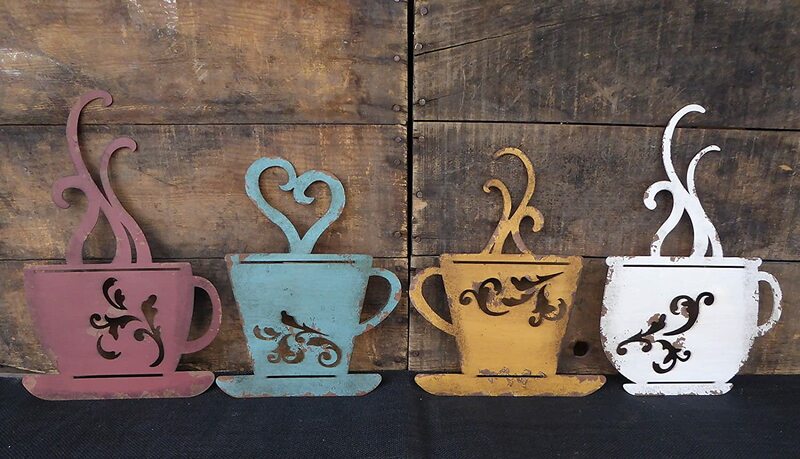 Metal Artist Tara Reed has created some truly delightful coffee decor pieces that would suit any style home. Her pieces are simple, yet delightful. 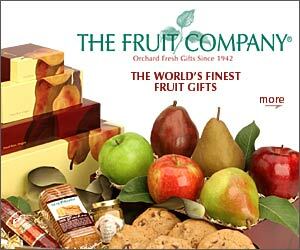 Perfect for yourself or as a fantastic gift. These vintage posters make a perfect display over the breakfast table! 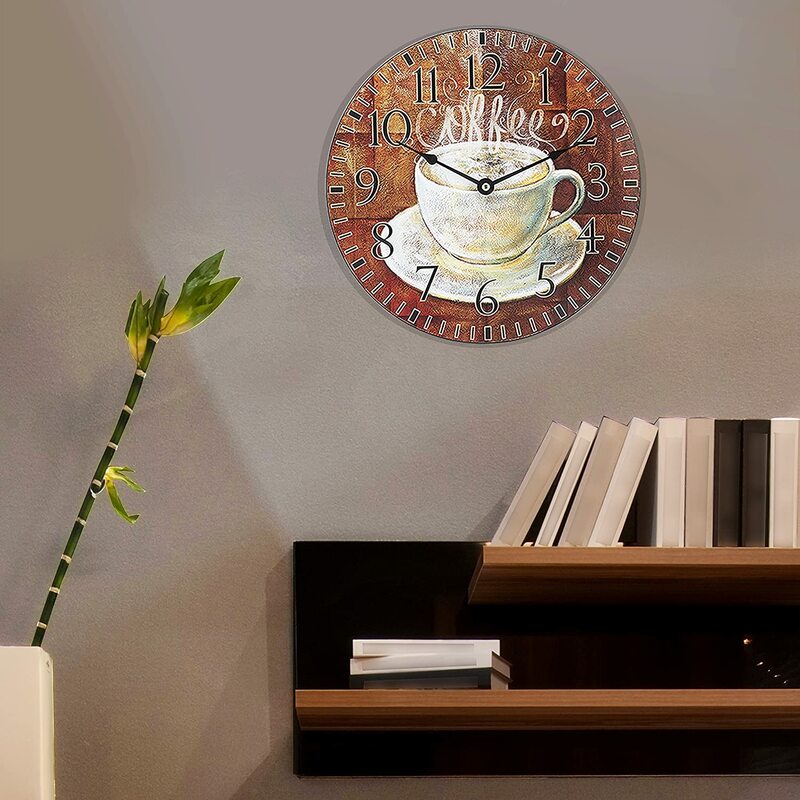 Another one of our favorite coffee clocks, this piece is simple yet effective in how it celebrates our love of coffee. Rustic, retro, and rusted this large “Coffee” metal cut out is quite wonderful. The Urban Cafe series is a wonderful celebration of coffee. Each piece is sold separately, so you can pick your favorite or purchase the entire set to create a complete display. I love the retro feel of this clock, as well as the sunburst design with the numbers. It really does feel like it would be at home in an old-school coffee shop, but it would also be a fun coffee decor accent in the kitchen. The vintage feel of this piece creates an old-school feeling, but it would fit with nearly any decor style. 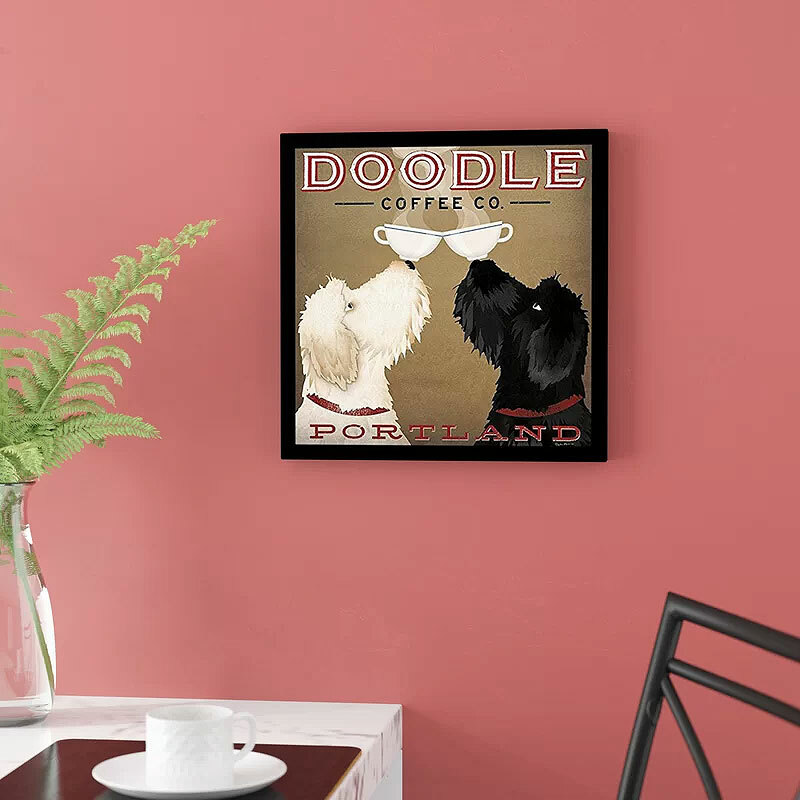 Inspired by our love of the Pacific Northwest (and they’re love of a quality cup of Joe), this graphic coffee art print by Ryan Fowler depicts a pair of caffeine-loving canines balancing cups of steaming dark roast on their noses. 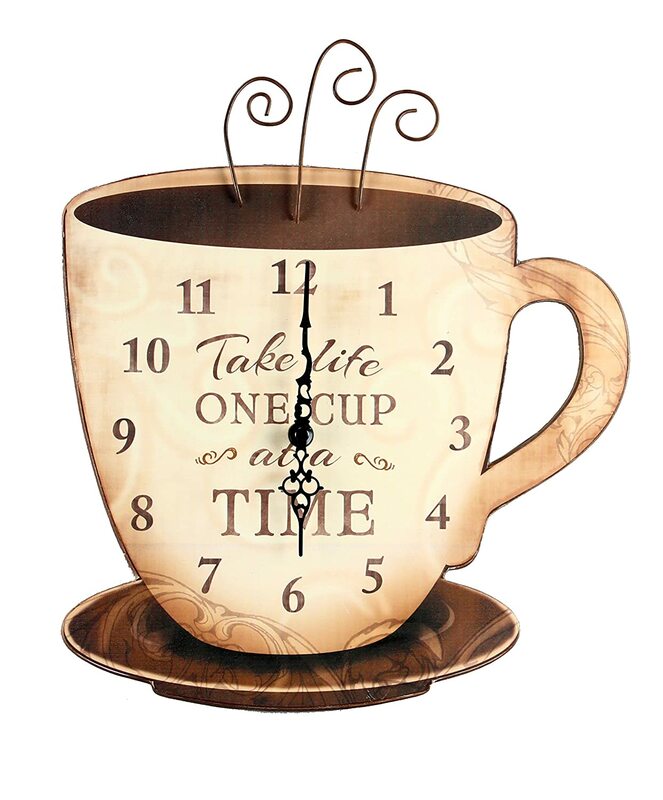 This piece absolutely screams “I LOVE COFFEE!” This would not be an appropriate gift for the tea lover in your life. You have to appreciate coffee to truly appreciate this coffee decor piece. 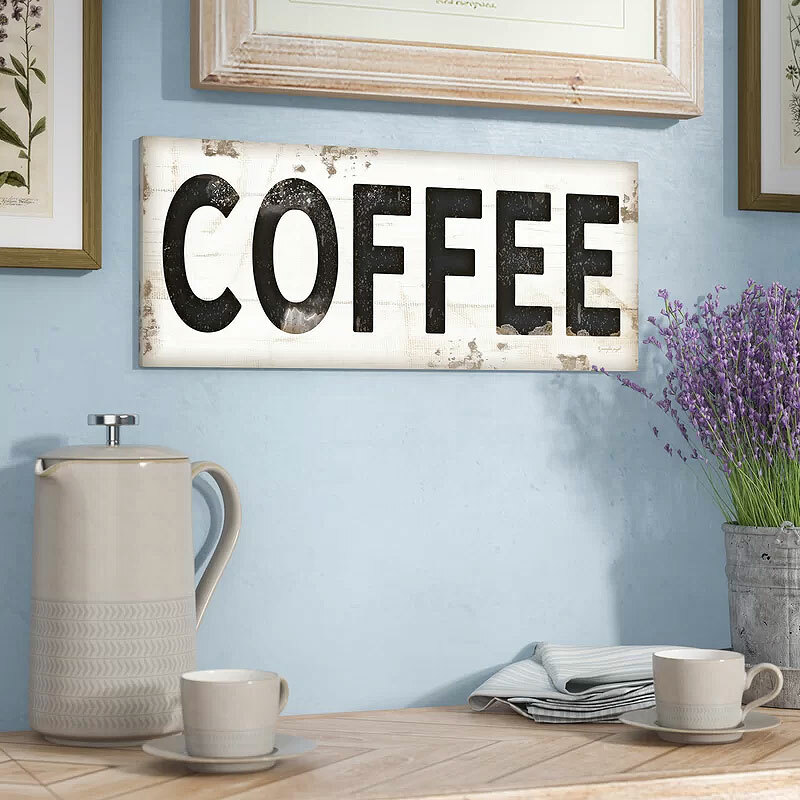 This vintage coffee shop sign would be perfect over an old school Formica kitchen table to create the look of a retro diner. 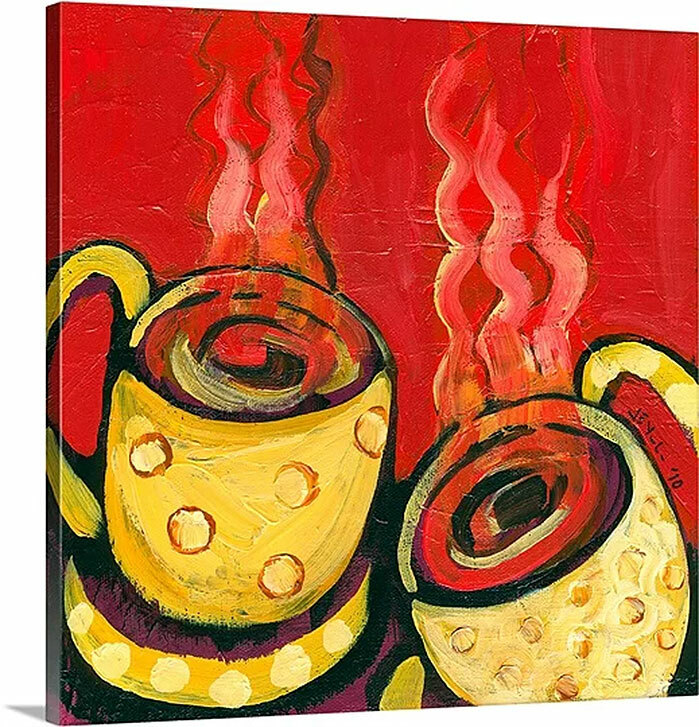 You can almost smell the fresh-brewed coffee coming off this 4 piece art set. 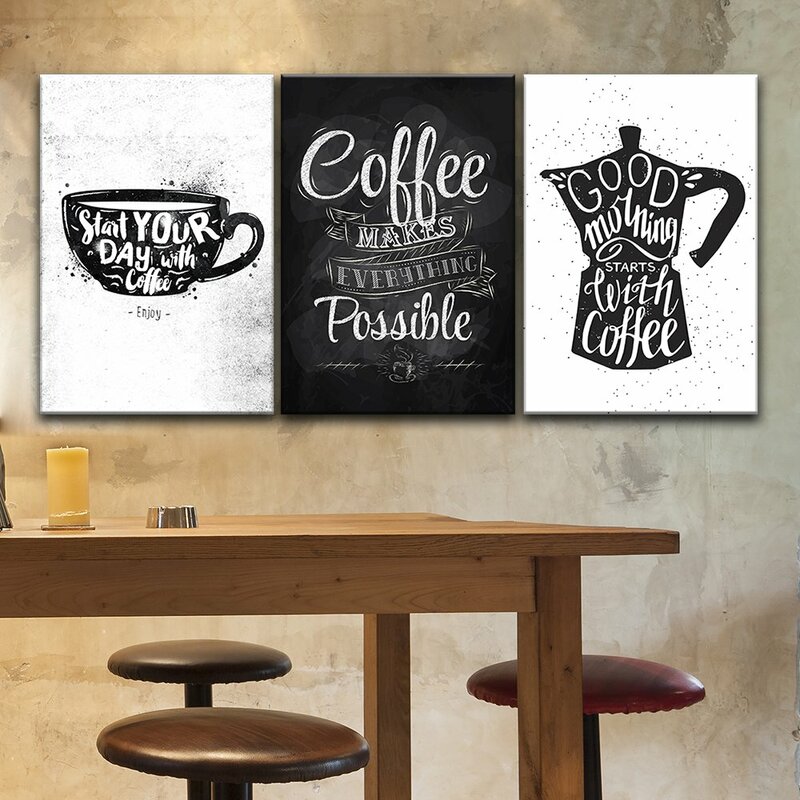 It’s so warm, rich, and inviting that it’s hard to imagine anyone NOT wanting a delicious cup of coffee after seeing these art prints. As many houses do, my house runs on coffee. And this sign is the perfect reflection of that fact. 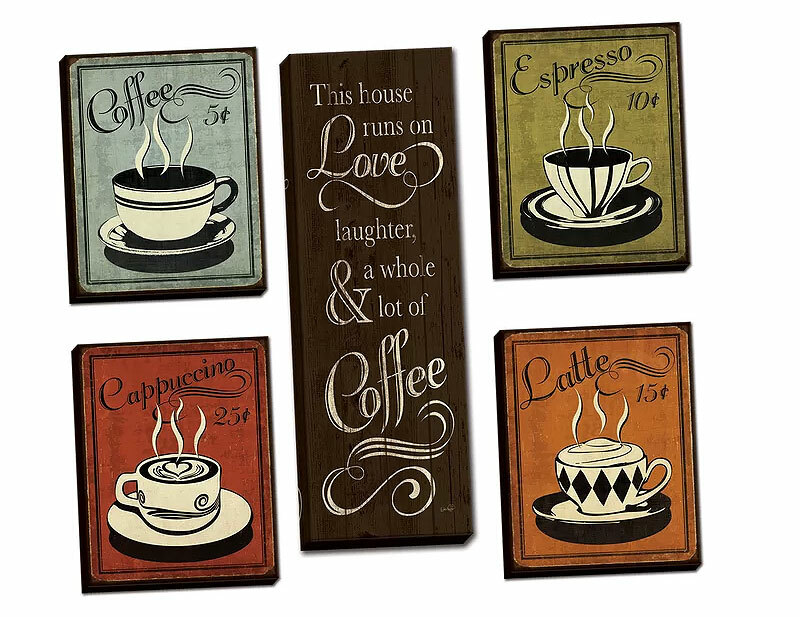 Whether you can’t start your day without a caffeine fix or you’re just going for a java-inspired aesthetic in the kitchen, you’re sure to appreciate this four-piece plaque set. Showcasing four different types of coffee shop favorites like espresso and cappuccino, they offer coordinating neutral tones of brown and beige. 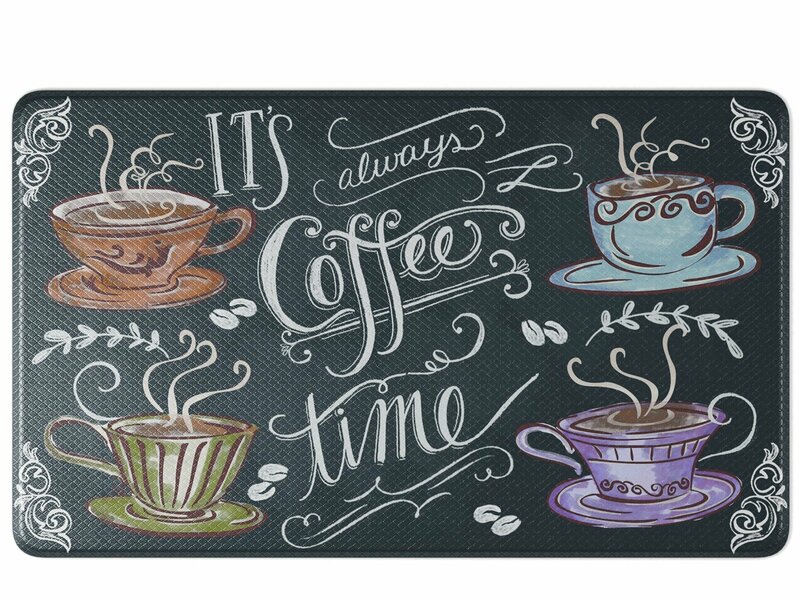 Each delightful coffee decor plaque is crafted from wood and measures 12” square. And what’s a coffee lover to do without the BEST COFFEE MUG EVER!! You don’t have to drink the most expensive coffee in the world to prove that you are a true coffee lover. 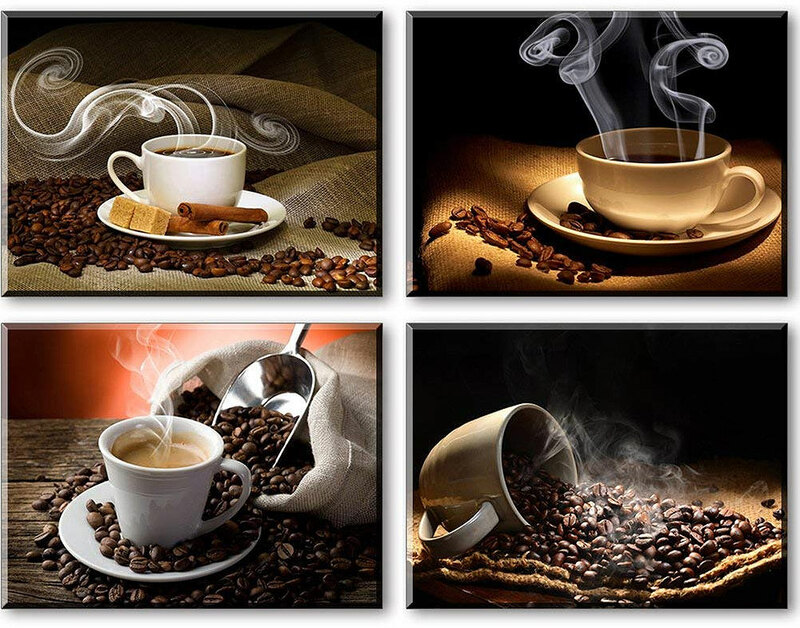 Whether you love fancy coffee or normal coffee, the important thing is that you love coffee.